While I really love Bette Hagman's brownies, sometimes I need a dessert that's even easier to make. 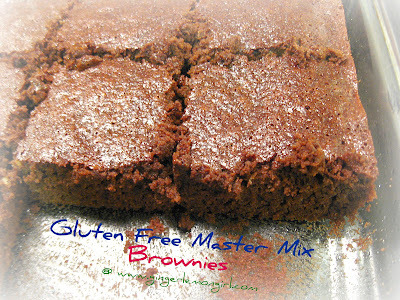 You can't beat brownies made from my favorite master mix. It literally takes less than 2 minutes to mix up these brownies and pop them in the oven. Brownies come in a variety of categories, but my favorites are "cake-like" brownies and "fudge-like" brownies. These easy master mix brownies are more "cake-like" in substance. Light and fluffy, but definitely full of chocolately goodness! These brownies have become a favorite at our house because the recipe is so easy I memorized it! Enjoy! Preheat oven to 350 degrees. Grease an 8x8 baking dish with butter -or- non-stick cooking spray. In a medium sized bowl whisk together all dry ingredients, set aside. In a large glass measuring cup combine all wet ingredients. Stir wet ingredients into dry ingredients. Pour batter into greased baking dish. Bake for 15-20 minutes. Brownies should be slightly "springy" to the touch when done. Makes 9 large squares. I'm currently working on revising several of my very early gluten free baking recipes to reprint on the blog! Want to suggest a recipe for improvement? A master mix for GF brownies?? omg Omg OMG! I heart you!! I prefer the dense, fudge-like brownies, but yours sound (and look) excellent! I don't know what it is about brownies, but they are *so* easily adaptable to g.f. (and even GFCF) baking. They taste just as fabulous to non-g.f.'ers. Many baked goods are so difficult to replicate as GFCF, but brownies are a winner, every time. They look delicious. I'll have to come back when I have more time to browse. Well...I can say that I've made these - even though I accidentally added too much oil (which by the way made them more chewy/fudgey,) and they came out WONDERFUL! Love it and this will be THE brownie mix. I can't imagine another coming out better. (BTW - I just had to cook them longer with the added liquid). hi...which master mix is best to use? i see different variations on your site. brownies r my absolute favorite and since ive been dairy, gluten, and soy free Im having trouble finding a good recipe! gina - you can use either recipe for the master mix! Whichever one you prefer! I think when I made this recipe I was still using the original master mix!